A couple of weeks ago, when I made meatballs stroganoff, I mentioned that I consider meatballs an easy to make dinner. It's probably because of that reason that I like experimenting with different flavors and ideas. So, if I can turn a stroganoff into a meatball, why not a chicken parm? The inspiration came from a dinner we had at a lovely waterfront restaurant over the summer. They served one of the best versions of chicken parm we've ever had and the idea of it stayed in my head. Sure, I could just make the dish but it's easier and more fun to make meatballs. Ground chicken breast is actually a wonderful medium for adding lots of flavors and, of course, it's much healthier than beef. Well, at least until you add all that yummy cheese. :) Healthy or not, though, these were a big hit and are definitely getting added to our dinner rotation. Enjoy! In a large bowl, combine the chicken, onion, garlic, egg, 1/4 of the breadcrumbs, parsley, Parmesan, salt and pepper. Place the remaining 1/2 cup of breadcrumbs in a shallow dish. Using a 1 oz. scoop or your hands, scoop the balls into the breadcrumbs and roll them around to coat. Transfer the balls to a baking sheet lined with parchment paper and bake in a 375 degree oven for 30 minutes. Add the tomato sauce to a large pot on the stove and bring to a low simmer. Add the meatballs, cover and leave on low for 30 minutes. When ready to serve transfer the meatballs to an oven safe dish, top with the mozzarella cheese and broil for a few minutes until the cheese has melted. Makes approximately 4 - 6 servings. I'm checking the mailbox over the next few days...for my share of these. What a great idea, Anita! 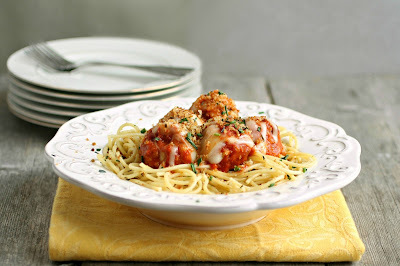 I am a huge meatball fan but I tend to make them out of beef and pork and never consider chicken. Why? Why?! Now I will. I do not make enough meatballs! This is a great idea! I LOVE this idea-those meatballs look INCREDIBLE! Oh you and all these meatball posts!! You're driving me crazy!! Looks so good! YUM! 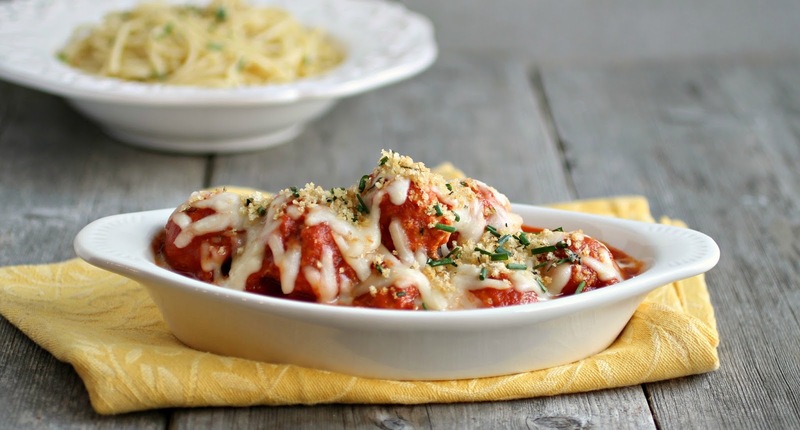 These look wonderful and chicken parm is one of my favorites! 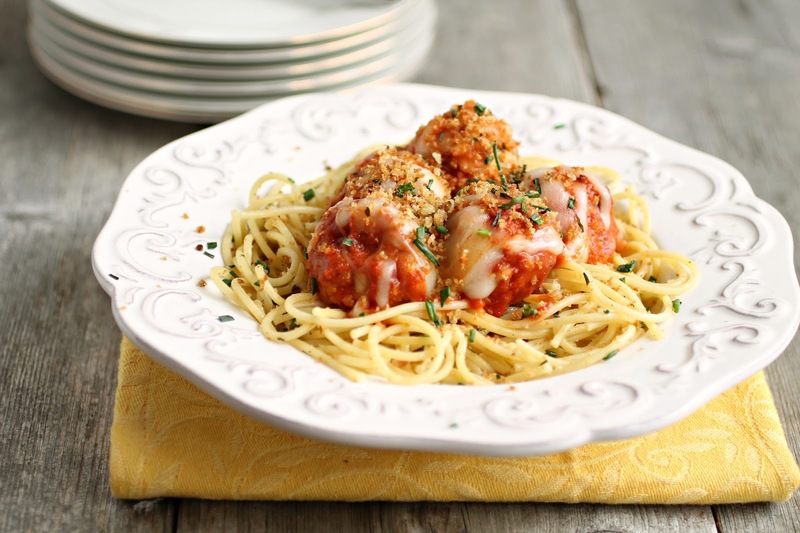 This looks great...love that you used ground chicken breast...so much healthier! I have to try this! This was delicious! I added two seeded jalapenos as well for a little heat. Thanks for the recipe! I saw y'all chatting about this on FB so I had to run over and peek. I may have to make this while B is here. Looks freaking fabulous.